Named for Henri Auguste Duval (1777-1814) French physician and botanist. 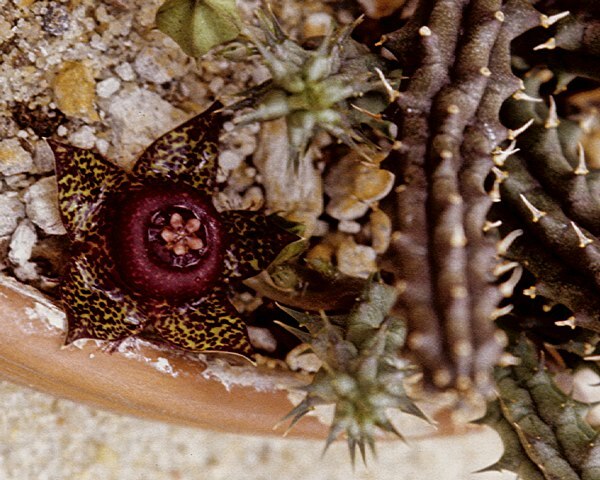 The genus Duvalia includes 22 species of creeping stem succulents from Southern Africa and Arabia. Stems are frequently jointed. Flowers have a distinctive disc-like corona and a stipitate gynostegium. 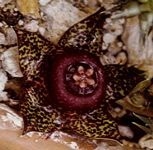 Cultivation is relatively easy as long as they do npot experience cold wet conditions, and similar to that for Huernia. The stems root at the joints as they spread across the soil and do not require much depth of soil. Propagation from cuttings or seeds. Fleshy, toothed light green 4-angled stems, mottled with darker green or purple produce large brownish to purple foul-smelling flowers.The reddish annulus is fringed with white hairs. The 5 brownish to purple petals are grooved longitudinally and fringed with dark hairs to a variable extent. Native to Southern Yemen, Saudi Arabia and the Sudan, typically growing among scrub on granite or sandy soils. Name: polita = polished, referring to the shiny base of the corolla lobes. Fleshy, toothed dull greenish-purple succulent 6-angled stems produce relatively large 5-petalled, shiny orange to purple flowers mottled with yellow to cream and with hairs between lobes. 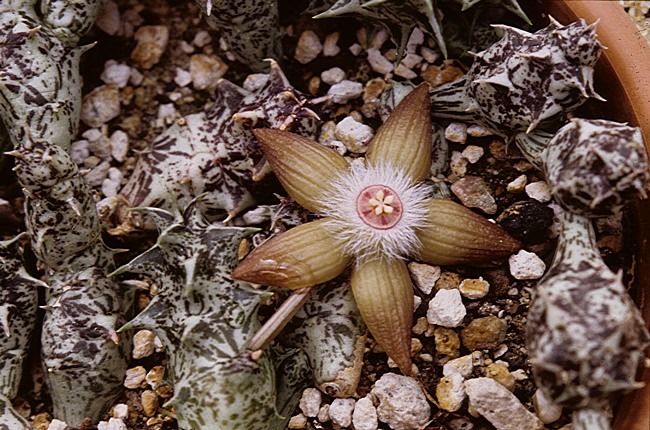 Native to Angola, Botswana, Malawi, Mozambique, Namibia, Zambia, Zimbabwe and South Africa, typically forming a mat among scrub on sandy or stony hillsides at elevations of 3000 to 5200ft. The stems are considered edible if baked and are sometimes harvested for food.